Here is a festive appetizer that you can put together with no fuss or stress. All it takes is a few minutes and voila, you have this. Cut the cream cheese at a diagonal. Place the two long sides together to form a triangle. Decorate with finely diced red pepper, top with a yellow pepper star. Unfortunately I didn't have a yellow pepper for the star, but when I make it again for Christmas eve I will. So very tasty and easy. Thank you Pinterest for the idea. 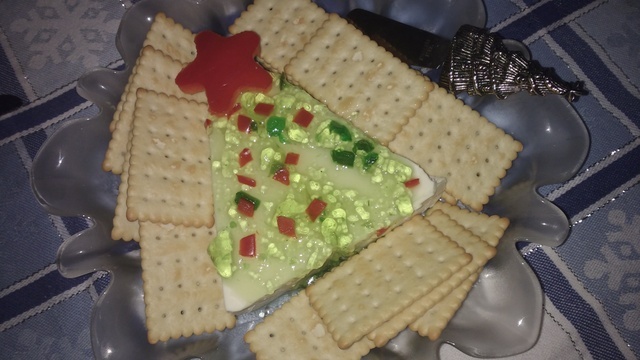 Yum, I've made that appetizer many times but never thought about doing it as a Christmas tree. How cute! Merry Christmas! !